M.I.A. really doesn't like Tenacious D.
Upset that you spent $225.50 to see the Beastie Boys perform and now they're not coming to Outside Lands? Even angrier that Tenacious D is taking their place? You're not alone. The always entertaining M.I.A. feels your pain. The British singer took to her Twitter account to rant about having to open for Jack Black and his lovable fat friend Kyle Gass instead of the famed hip hop trio. The singer said the only reason she signed on to the three day San Francisco festival was to open for the Beastie Boys, who canceled their tour because member Adam Yauch was diagnosed with a cancerous tumor. And now she can't get out of the performance and she is upset. 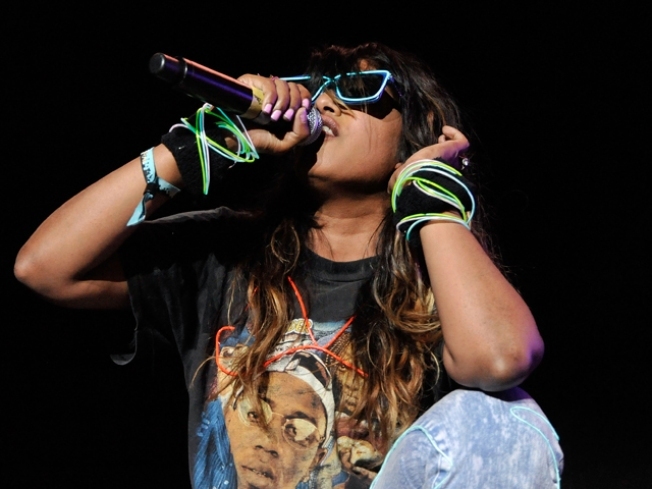 To highlight her anger, M.I.A. tweeted about her frustration to her 66,000 followers in all caps. "CANT BELIEVE THEY REPLACED BEASTIES WITH TENACIOUS D ????????????????????? ?AND IF I PULL OUT THEY SUE! SO REALLY? TENACIOUS D AFTER ME ?" @_M_I_A_ tweeted. She continued, "P.S I ORIGINALLY BOOKED ON SHOWS COZ BEASTIES WERE HEADLINERS , BUT NOW THEY AINT DOING IT AND I JUS WANNA SAY , WE HAVE TO GO HARD!!!" SFist questions what having to "go hard" means and the singer might have explained herself when she threatened to inflict concert goers with bird flu "JUS TO MAKE A POINT" and by welcoming everyone to join her protest by rushing the stage.